Houston, TX. 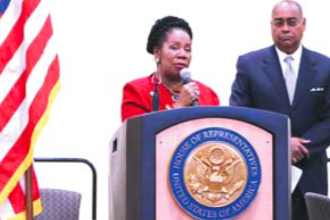 Friday, February 17, 2017 — At the Julia C. Hester House, Congresswoman Sheila Jackson Lee of the 18th Congressional District joined with Harris County Commissioner Rodney Ellis and health professionals at a community forum on saving the Affordable Care Act (ACA), a law that has expanded the access to affordable health care to millions of Americans. Health Professionals included, Dr. Natalie Dailey infectious disease specialist; graduate Harvard Medical School, George Masi, President and CEO of Harris Health, Steve Schnee, Executive Director of the Harris Center for Mental Health, Dr. Janice Beal, Ann Thielke, CEO, Good Neighbor Healthcare Center-Fourth Ward Clinic, Dr. Ann Barnes, Chief Medical Officer, Legacy Community Health Montrose Clinic, Steve Williams, Director, Houston Department of Health and Human Services and Dr. Dona K. Murphey, Formerly Associated with Baylor College of Medicine. • 100 million Americans no longer have a life-time limit on healthcare coverage. • 17 million children with pre-existing conditions can no longer be denied coverage by insurers. • 6.6 million young adults up to age 26 can stay on their parents’ health insurance plans. • 6.3 million Seniors in the “donut hole” have saved $6.1 billion on their prescription drugs. • 360,000 Small Businesses are using the Health Care Tax Credit to help them provide health insurance to their workers. The risks of repeal and dismantle, the plan Republicans have for the ACA are profound. In Texas alone, 1,874,000 individuals who have gained coverage since the ACA was implemented could lose it if the law is entirely or partially repealed. GALENA PARK’S COUNCIL MEETING THIS WEEK was marked by yelling and verbal epithets between the audience and council members and the Mayor, and also between councilmen themselves. Commissioner Eric Broussard in a heated exchange, called out to the Mayor “You’re a Big Liar” as they were arguing over needed repairs and remediation to the Evelyn Churchill Community Center Building in Galena Manor. Police Chief Ed Mata, seen above right, stares down a heckler from the audience, warning her that she could be removed from the room if she speaks out again. 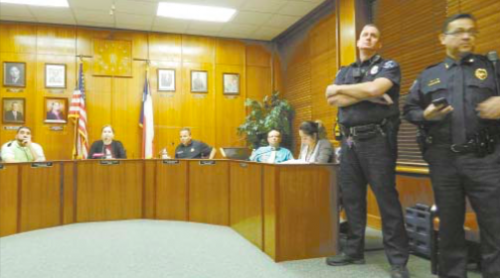 GALENA PARK – Several controversial issues were on the agenda for this week’s City Commission meeting Tuesday night, and disagreements and accusations set the tone for the meeting. In addition to some heated words between commissioners and the Mayor, the audience also expressed displeasure in the way the city was being managed. Discussions and words became so loud and heated that the Galena Park police entered the room, and moved toward the perpetrators, in an attempt to quiet them down. After approval of minutes, the Commission passed a resolution regarding the public’s right to see government records. City Attorney Robert Collins made a point that the wording of the resolution followed state guidelines for Open Record Requests. Some in the audience felt it was an effort to restrict public access to information. In the most important agenda item, and not without controversy, the Commission discussed and voted on putting on November’s ballot an item that would allow the sale of alcoholic beverages within the city. Commissioners Silva and Broussard said they felt the resolution was not clearly written, needed more time for discussion, and should be tabled. City attorney Collins said they had to vote on it, because there were sufficient petitions received to require a vote by state law. When the vote was 2-2 to table, Mayor Moya declared “the Ayes have it” by voting too. 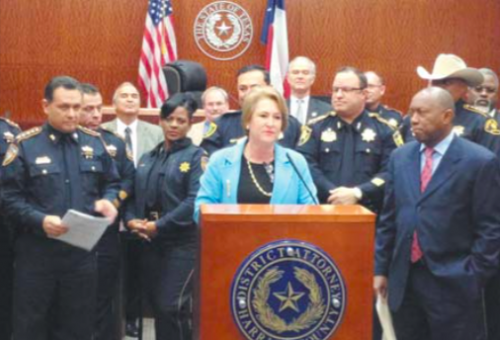 District Attorney Kim Ogg (center) announced the diversion program during a press conference held at the Harris County Criminal Justice Center, where she was accompanied by Houston Mayor Sylvester Turner and Harris County Sheriff Ed Gonzalez, among others. Harris County District Attorney Kim Ogg announced Thursday a new program to deal with cases of low amounts of marijuana that she described as part of a new era in the county’s criminal justice system. “You will be offered a chance to sign an acknowledgement form promising to take a decision making class, a cognitive decision making class. Takes four hours and costs $150. You’ll be required to do that within 90 days,” Ogg explained during a press conference held at the Harris County Criminal Justice Center, located in downtown Houston. Thursday, February 16, 2017 — The Galena Park Community Council of PTA’s Founder’s Day Banquet held in the Joyce Zotz Education Center was most exciting with hundreds of PTA and school faculty members’ coming together as a unified team and goal of helping students obtain a higher education. Excitement and love filled the air; strong competition was evident between the schools, each trying to donate the most scholarship funds. Over $14,000 was donated with more coming in later from other sources. GPISD’s twenty-four PTA chapter’s each had a school representative come to the front podium to announce their contributions; each announcement brought loud cheers and applause from the unselfish volunteers in attendance. Jacinto City Elementary made the highest elementary school donation and Galena Park High School was highest and overall highest too.